Start to Finish - OPI is an OPI 3 in 1 treatment. This formula is a base coat, nail strengthener and top coat all together to create a professional result. Helps extend the wear of your color with the benefits of a fortifying to leave nail stronger and more flexible. 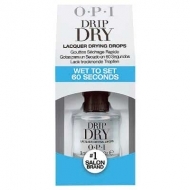 Creates a high-glossy finish when used as a top coat and also acts as a color protective formula. Use as a base coat or over the last nail polish layer.